The gym teacher—a big bear of a man—surveys his fourth and fifth graders at recess, inert and buried in smart phones and laptops on their battered schoolyard. He challenges them to enter a jungle of imagination, to take on the roles of animals and the young human foundling raised by wolves who faces life and death decisions, and the future. 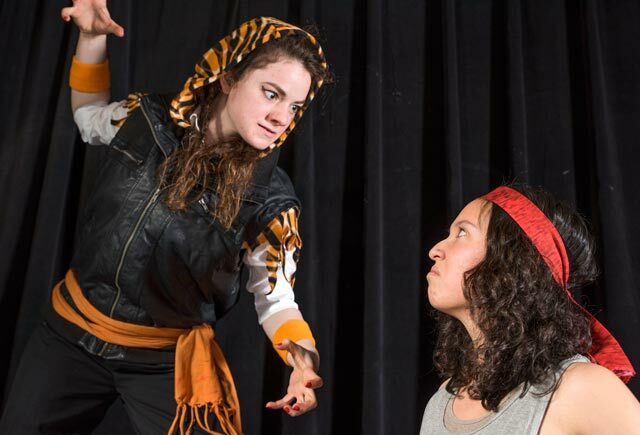 So begins the HSU production of Edward Mast’s 1984 play Jungalbook, a family drama with comedy and magic based on tales from Rudyard Kipling’s famous The Jungle Book. It opens in the Van Duzer Theatre for a two weekend run on Friday February 26. Director Troy Lescher has divided the play into short, fast-paced scenes, as 11 HSU student actors play school children who transform themselves into animals with bits of clothing left behind in a “lost and found” box. Masks and puppets add to the magic of transformation. The story centers on Mowgli (played by Camille Borrowdale), a human baby left in the jungle but saved by the panther Bagheera (Bryan Kashon), who bargained with Akela, the leader of the wolf pack (Hanah Toyoda), to protect and raise the infant. Now Mowgli is ten, befriended by Baloo the bear (Matthew Hern) but endangered by the tiger Sherakhan (Jenna Donahue.) Other animals—elephant, python, monkey, vulture and hyena—populate her world, as she learns the laws of the jungle. Mowgli also faces questions of identity, and whether the jungle or the human village will be her home. Other themes include loyalty, trust, friendship and dealing with fear. Moving the jungle to “the blackboard jungle” also focuses a contemporary issue: “One of the major themes of the play is bullying,” Lescher said. Winner of a Distinguished Play Award from the American Alliance for Theatre and Education, Jungalbook is widely produced by professional, community and school theatres, from universities to elementary schools. The cast also includes Roman Sanchez, Elio Robles, Ivan Gamboa, Rilo DeAnn, Ashlyn Mather, Josh Banuelos and Isabella Ceja. Derek Lane is the scenic designer, James McHugh designed lighting, Cory Stewart and Derek Lane designed sound, Alexander Stearns designed costumes and hair, and Sydnee Stanton is the props, puppet and mask designer. Jungalbook runs about 75 minutes without intermission. In addition to public performances, more than 600 students from Eureka, Arcata and McKinleyville elementary (grade 3 and higher), middle and secondary schools will attend a special show on the morning of March 2. Jungalbook is performed in the Van Duzer Theatre at HSU on Friday and Saturday, February 26 and 27 at 7:30 p.m., and Thursday through Saturday evenings, March 3-5, with a 2 p.m. matinee on Sunday March 6. Tickets are $10 general/$8 students and seniors, with a limited number of free tickets for HSU students at each performance, from the HSU Ticket Office (826-3928) or at the door. More information: http://HSUStage.blogspot.com. Produced by HSU Department of Theatre, Film & Dance.